On Sunday at FOSDEM, I have a 5 minute lightning talk about extracting data from open source communities in the HPC, Big Data, Data Science devroom (slides). Open source communities are filled with huge amounts of data just waiting to be analyzed. Getting this data into a format that can be easily used for analysis may seem intimidating at first, but there are some very useful open source tools that make this task relatively easy. The primary tools used in this talk are the open source Metrics Grimoire tools that take data from various community sources and store it in a database where it can be easily queried and analyzed. 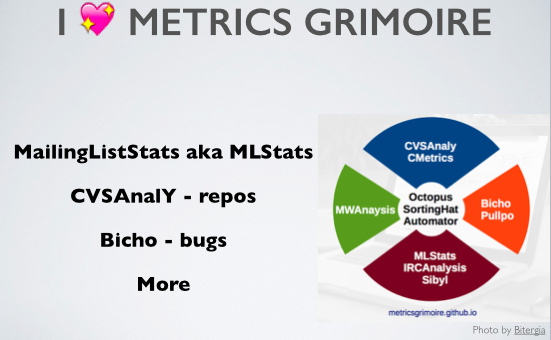 It’s very easy to get started with MLStats and CVSAnaly and use them to import data from your mailing lists and code repositories. Gource is an amazing tool to visualize activity from your source code repositories. I did a full talk about Gource on Friday at the FLOSS Community Metrics meeting, so have a look at that blog post for details about using Gource.